The Kalapana Lava Viewing Area in the Puna District on Hawaii's Big Island was, as of December 2009, the only place on land from which you could see the current lava flows of Kilauea volcano, including the place where lava flows into the Pacific Ocean. The Kalapana Lava Viewing Area was located at the end of Highway 130, about 32 miles or an hour drive from the town of Hilo on the east coast of Hawaii's Big Island. It was a little over 40 miles and slightly over an hour drive from the entrance to Hawaii Volcanoes National Park. 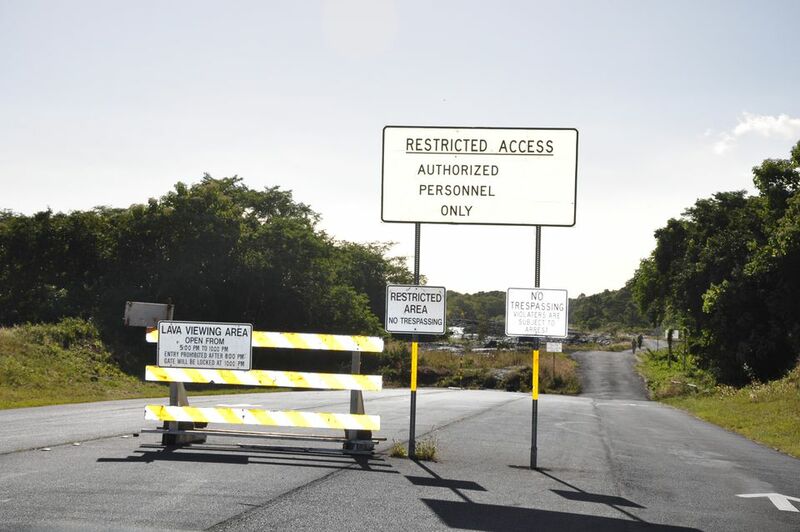 The easiest way to reach the Kalapana Lava Viewing Area was to take Mamalahoa Highway (Highway 11) until you reached the town of Kea'au and look for signs for Highway 130. The highway is on your left if traveling from Hilo and on your right if traveling from Hawaii Volcanoes National Park. From Kea'au follow Highway 130 until the road ends and you would see the Restricted Access signs shown above. Once you pass these signs you would drive about a mile over a rough road to the parking area where County employees would direct you where to park. There was no admission charge, although once you reach the beginning of the trail, you found a box for donations to help defray costs. As of March 2012, the County of Hawaii announced their intention to close the Kalapana Lava Viewing Area due to budgetary issues. As of December 2012, the site remained open, however, the county has removed its website that offered updates on the status of the viewing from this area. In late 2016, after almost four years, lava has once again begun to flow into the ocean and a new lava viewing area was opened in Pahoa. The information in this feature is a retrospective on a visit in 2009 and is not intended to be a guide as to how and where to see the current lava flow. We hope you enjoy our photos of our visit to the Kalapana Lava Viewing Area in December of 2009. The Kalapana Lava Viewing Area was not open on all evenings. If wind conditions were blowing volcanic gasses towards the viewing area, the viewing site was closed, as it was on my first attempt. A Lava Hotline was updated daily and confirmed whether the lava viewing site would be open that day. The telephone number for the Hotline is (808) 961-8093. (This number continues to operate as of January 2017, however, the 2016 Pahoa Lava Viewing Area is to be closed as of January 30, 2017.) Additional information can be obtained at (808) 430-1996. At the time of my visit in December 2009, the viewing area was open daily from 2:00 p.m. until 10:00 p.m., as long as conditions remained safe for the public. Conditions can change rapidly and the viewing area was closed when changes occurred that threatened the safety of viewers. The last vehicles were allowed in at 8:00 p.m. to allow people adequate time to view the lava before the site closed at 10:00 p.m. My advice was to arrive as close to 5:00 p.m. as possible, so that at least half of your hike to the viewing site would be in daylight. In Hawaii, the sun sets very rapidly and darkness arrives quickly. After you park your car you walked through a vendor area where numerous vendors sold souvenirs, including excellent photos of the lava flows, as well as items required by the County for your hike over the lava flows to the viewing site. At the end of the vendor area, it was a short walk to a small booth that marked the beginning of the marked trail across old lava flows to the viewing site near the ocean. A sign at the start of the trail warned visitors to follow the marked trail. Failure to do so was not only dangerous but could lead to your arrest. The sign also advised you about the current activity and viewing conditions. Will you see lava flowing into the ocean? Will you see lava flowing down the mountain? How far from the viewing site is the place where lava is flowing into the ocean? The activity and conditions change daily. In order to make the hike to the viewing site, you were required to have several items: water, proper footwear (hiking shoes are advised) and a flashlight. It's also smart to wear long pants, ideally jeans. Lava is hard, uneven and sharp in places as you may know if you have ever fallen while hiking on it. Depending on the weather you may also consider bringing a hat or umbrella. A hiking stick is also useful. There were a very limited number of portable toilets in the parking area. From the parking area, it was a walk of between one quarter to one mile across lava flows that date to between 1986 and 1992. The distance varied as the lava flow changes direction. The viewing area's name derives from the name of the town of Kalapana which was located nearby and which was destroyed by lava flows of Kilauea in 1990. The lava flows in this area are considered the southeast rift zone of Kilauea. The lava flow that is currently active in this area began in 2007 and was flowing relatively steadily as of December 2009 with only a few periods of inactivity. To reach the viewing site you walked across uneven lava for anywhere between a half hour to an hour in each direction based on your hiking ability. Your return hike was likely to be in the dark, hence the necessity of a good flashlight. As you walked across the lava flows, I noted how even though these flows were only 20 years old, new vegetation has already begun to grow from within the cracks. Birds and the wind have deposited seeds which have already begun the process whereby this area may someday see the lush vegetation that marks all of the Hawaiian Islands. In the distance, you saw the plume of steam that marks the area where the lava has flowed into the ocean. While much of what you saw is steam caused by the hot lava entering the much cooler ocean, the steam also contained dangerous volcanic gasses such as sulfur dioxide (SO2) and fine particulate matter (PM2.5). People with health issues, particularly breathing disorders such as asthma should avoid proximity to these gasses even when you are in Hawaii Volcanoes National Park. The lava flow that you were walking across consists of a type of lava known by the Hawaiian name as pāhoehoe lava. Hawaiian volcanoes erupt two types of lava, pāhoehoe and ʻaʻa. The terms pāhoehoe and ʻaʻa were the words used by native Hawaiians for these two types of lava flows. Geologists in Hawaii adopted these terms in the 1800's and they are today used by scientists internationally. Pāhoehoe is basaltic lava that has a smooth, billowy, undulating, or "ropy" surface. These surface features are due to the movement of very fluid lava under a congealing surface crust. ʻAʻa is basaltic lava characterized by a rough or "rubbly" surface composed of broken lava blocks called clinker. It is much harder to walk across an `a`a lava flow. Before too long, your destination was within sight. There were many people already at the viewing site, but they made the right decision. The hike was much easier in the daylight and can twice as long in the dark! Almost all of the folks brought cameras and many, more serious, photographers also brought tripods. A good zoom lens is a must to get those closeup shots of the red lava flowing into the ocean. The earlier you arrive the better chance you had of getting a front row seat and more importantly a place where you could find a raised area of lava to use as a seat since you were likely to stay at least an hour. When you first arrive you likely saw just the white or gray-white plume of steam above the site where the lava is flowing into the ocean. Just wait, however, something truly spectacular was just minutes away. Shoot as many photos as you can during your time at the viewing site. That's the great thing about digital cameras - you can always delete the shots that don't turn out. Many folks at the viewing site were surprised to see a boat so near the point where lava is flowing into the ocean. In fact, lava boat tours are very popular, but not without some critics who feel that they are too dangerous. The Kalapana lava viewing site was opened to the public on March 8, 2008. Through December 2009, 241,806 people visited the site as reported by hawaii247.org, a non-profit news site, focused on the Big Island. Hawaii247.org goes on to explain that "the County's cost to operate the site, including salaries and wages, supplies, toilets, security, phones and other equipment, amounted to $362,006 for the period July through December 2008." That's a significant amount for the cash-strapped County of Hawaii. As the sun begins to set, you began to see the hint of red appearing where the lava entered the ocean. As darkness arrived a distinctive red glow was clearly visible, even to the naked eye. If you were lucky you'd see several explosions of lava or of lava debris within the cloud. You have arrived at the only spot on earth where the planet grows every day of the year as it has done for over 25 years. You are truly standing at the edge of creation. A visit to the Kalapana Lava Viewing Area is just one of the many great volcano-related experiences you can have on the Big Island of Hawaii. We certainly encourage all Big Island visitors to spend a day at Hawaii Volcanoes National Park where you can learn all about the volcanoes which created the Hawaiian Islands, view numerous past lava flows and craters, walk through an ancient lava tube and much more. You can take a helicopter ride over the current lava flow and see the huge Pu?u ?O`o Crater from which the current flows emanate. I recommend the Doors-Off Volcano-Waterfalls experience with Paradise Helicopters which will provide you the chance to feel the heat of the worlds most active volcano. You can take a tour with Lava Ocean Adventures which I mentioned previously and see the lava flowing into the ocean closeup. Watch for our upcoming feature with lots of photos. KapohoKine Adventures offers not only tours of Hawaii Volcanoes National Park both by land and in the air, but also an excellent tour of the Puna District called Secrets of Puna. It's a great way to see one of the areas of the Big Island that most visitors never discover.